There has been a big change in marketing. You’ve noticed it, but you may not be able to put your finger on it. I have talked about it before. It’s the longing for the days when you used to place one ad in the Sunday newspaper and that was it… that’s the easiest concept to grasp. Now, when you go to place an ad, you wonder where the people are, it’s very disconnected. Even if you decide to place an ad, you can place it on radio, or the digital version of radio, satellite radio, the website of the radio station it gets crazy. One note on placing ads, be very careful to understand what it is you are buying. I notice something odd when we placed an ad for local reach cable TV. I had two TV’s side by side with the same channel on. It was the newsbreak, the big TV played a national commercial, the small TV played our boat yard commercial. How’s that for interesting??? Yes, I was paying for ads to run during the national news on the local cable play area. But you know what happens, it does not play on digital televisions. SO what that meant and why I’ll never advertise on cable again, is that my ads run on the “old” TV’s in the house, not the big nice one that most likely the “decision makers” in the home watch. Pretty crappy, eh. That’s right, I had two TV’s in the same room on the same channel, one was a digital, one was an analog, and two different commercials ran. Be careful where you advertise. When I brought this to the attention of my cable sales provider, they had no idea, that was 4 years ago, AND, by the way, they still advertise “reach” the same way and do not break it out. Another interesting change in marketing is the philosophy that the users of your product decide what the message of your brand is… you no longer decide what the message of your brand is. That’s a scary concept for “old school marketers”. We were once in control of the brand message, but now with social media, your message can change in an instant. The brand is the feeling the consumer receives from engaging with your business. That will make you think twice. That’s why today’s inspiration is more of a guideline. Marketing has changed. It’s not quite as unfamiliar as you think, but it is different. You need to tell a story. What you do will evolve around that story. 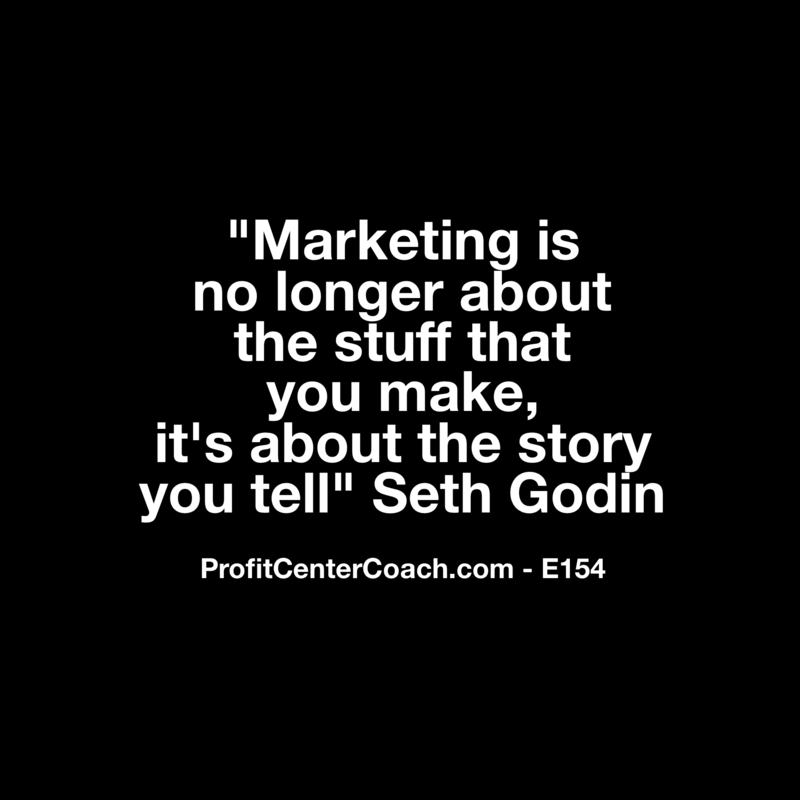 The goal is that the consumers interacting with your product will experience that story. When the story and the reality do not match, that is when you have a negative encounter, whether an email or review. If you say fast shipping, and it takes 3 weeks to arrive, that’s a disconnect. If you say, family environment and do not have a kid’s menu, that’s a disconnect. The part you control is the disconnect. Therefore, control the disconnect before it happens! When you control your story, mixed with yesterday’s concept of creating an ideal customer, you will discover the best places to advertise. Ironically, they may be very different and much cheaper than you’ve previously encountered. I’ll leave you with this, why advertise on cable to the entire metro area of 200 miles, when 80% of your customers come from the two area school districts 5 miles away? Advertise in their sports or theater brochures or other creative sources to reach the parents! 1- What is your story? Start by making a list of the things that you want to be known for or that you are known for. Identify any gaps in where your customers might “disagree” and tighten up the gap. Have you ever experienced a “gap” meaning you researched a company, only to find the reality very different?